KASAI Elite Grappling Championships have added a third feature superfight to KASAI Pro 2 as Marcos ‘Loro’ Galvao takes on AJ Agazarm at 155lbs. “This matchup adds another compelling story to our stacked main card on April 14,” said Rolles Gracie, KASAI President. Galvao, 36, is a professional mixed martial artist best known for winning Bellator’s World Bantamweight Championship. 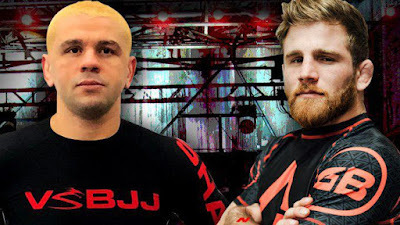 A black belt in Brazilian Jiu-Jitsu under Nova União head coach André Pederneiras, he has also competed for the likes of WEC, Shooto, and Jungle Fight over a 14-plus year career. Agazarm, 27, is an IBJJF Pan American no-gi champion, a European no-gi champion and a world no-gi champion at brown belt. In 2017, the Gracie Barra student under Eduardo de Lima and Carlos Gracie Junior finished second at the ADCC world championships and the IBJJF world no-gi championships. Agazarm also competed in KASAI’s inaugural event, KASAI Pro, back in December.